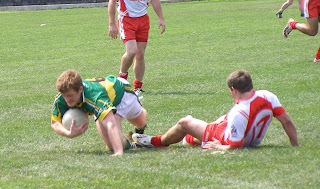 Christopher's beat the Wolfe Tones last Saturday, and came from behind to do it. Now the Tones must sit a wait to see what happens Sunday as the outcome of the Kerry v McAnespies game will determine their fate. The Tones will be hoping that Kerry can overturn McAnespies, which would mean a playoff between the teams for the fourth and final Playoff spot. 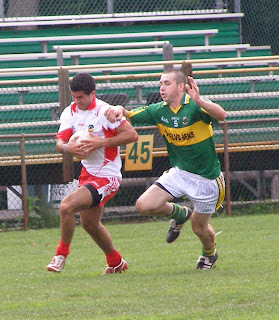 Kerry really have nothing to play for as they are locked in to the intermediate semi-finals, but the prospect of beating the Boston and North American champions could be enough for them to raise their game heading into the playoffs. Either way, a toss of a coin will have to determine who plays who in the senior semis as it is likely that Donegal and Christopher's will be joint top with 14 points. Donegal just need to beat Cork who are out of it altogether. Most likely McAnespies will join the Shannon Blues to share third and fourth. 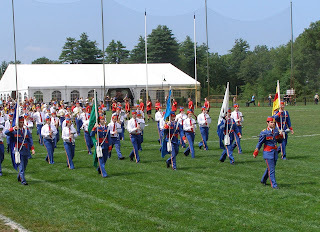 On the intermediate front we will probably have the Wolfe Tones, Kerry, the Gaels and Armagh-Notre Dame. Armagh-ND need to beat Mayo to ensure their place in the intermediate playoffs. Galway will be hoping for Mayo to make a face saving effort and then beat the Gaels themselves. I'd be betting on a Wolfe Tones v Armagh-ND and Gaels v Kerry semi-finals pairing. Sunday next features Galway and Tom's. A Galway win puts them into a playoff spot. 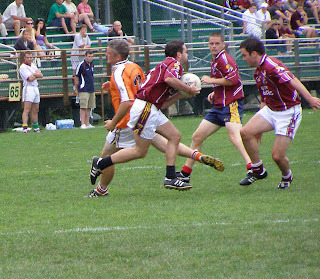 Tom's need to win to force a playoff game with Galway for a semi-final place. Both teams have blown hot and cold, but if Tom's can find the resolve that they showed last Sunday Galway will be in for a difficult hour. Tom's have already beaten Galway, and Galway will need to tighten up their game in all areas in order for them to continue in the championship. Could be a good one next Sunday! 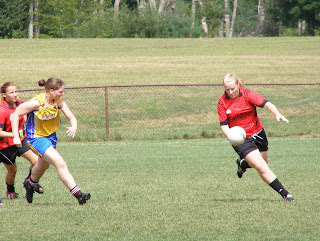 The Roscommon ladies pulled off a win last weekend and will again play the Shamrocks to see who advances to the ladies final where Tir na nOg await the winners. 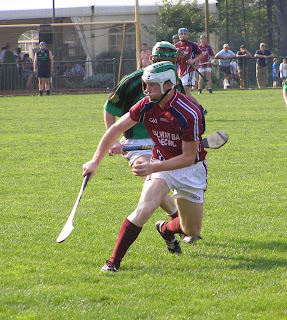 Tom’s had to win this game to keep their interest in the senior hurling championship, and win it they did with a fine performance full of heart and determination. In spite of having plenty of opportunities late in the game to decide that they had given it their best and it was not to be, Tom’s refused to die. Having led early, Tom’s led the lead slip and late in the second half looked dead and buried after Conor Kavanagh put the Tipp into a one goal lead with minutes left. Tom’s wanted the win badly and the bloodied Fran Keenan and substitute Ger Henley combined with a goal and a point respectively to win the game and keep Tom’s in the championship. 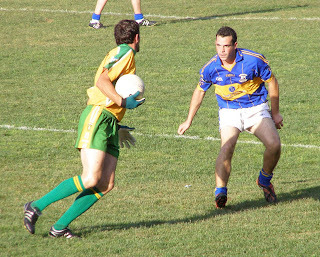 Darryl Dooley tries to win the ball for Tom's as things turning Tipp's way. Tom’s came out of the blocks strong to keep their chances alive. Eanna Murphy latched on to a long clearance out of defence and in firing the ball past Jim Howard, kept his goal a game streak going. Shane Menton opened Tipp’s account with a pointed free, and the sides matched each other for scores over the following 10 minutes. Fran Keenan’s two points for Tom’s were answered with one a piece from Menton and James McCarthy. Tom’s were fired up and gave no quarter in their own territory. Donal Moore rediscovered some of his old form in the half back line, and Shane Staunton at corner back also stood out for Tom’s. With Tom’s on top, Trevor Kelly, Donal Moore, and Shane Howley each pointed and Tom’s led by five points mid way through the half. 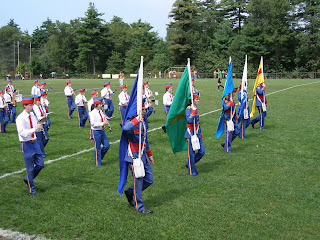 Tipp, however, began to get their act together. David Young and Eoin Ryan cut out a lot of ball played into the Tom’s forwards, and four points on the trot reduced the Tom’s lead to a point. Two came from placed balls taken by David Young, Menton and Conor Kavanagh accounted for the others. Tom’s needed a score to stem the Tipp flow, and it came from a Fran Keenan free. McCarthy answered for Tipp, but Keenan ensured that the half ended on a positive note for Tom’s with a massive free from his own 45. At the half it was Tom’s by two points, 1-7 to 0-8. 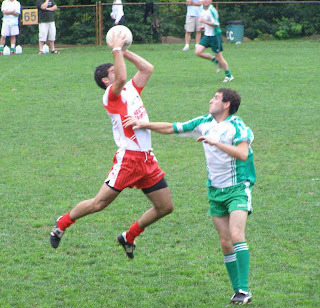 James McCarthy rises highest to win this puckout. Tom’s opened the second half in the same manner as the first, hitting Tipp with a goal from the get go. This time it was wing forward Shane Howley who rattled the Tipp net, Howley took a well waited pass from Trevor Kelly and fired home. Fran Keenan followed with a free to put Tom’s two goals clear. Tipp are no pushovers however and the lead fizzled quickly. 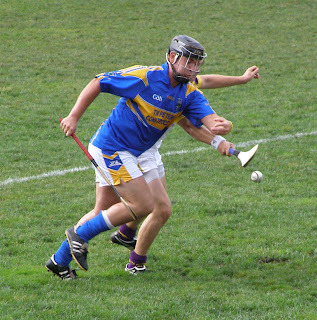 Tipp tallied a goal and three points in the space of ten minutes, with no answer from Tom’s. Tipp sent practically every puckout back with interest. Shane Menton pointed and Paul McGrath netted a 21 yard free. James McCarthy put two frees over, and with the sides now level all that Tom’s had worked hard for had disappeared. Fran Keenan put Tom’s back in front only to be cancelled out by a Pat Howard point. Aaron Bendon made a great stop to deny Tipp a goal and the game hung in the balance, but Tipp looked the likely winners. After McCarthy and Donal Moore traded scores, a goal came for Tipp. A dropping ball on the edge of the small square was sent into the net by Conor Kavanagh who chose to use the hurley while Paul Callinan was looking to catch – hurley beats hand every time. With a few minutes on the clock Tom’s still had a chance to come back, and they took it. Fran Keenan, who had left the field for treatment to a head injury earlier in the second half, ran 15 yards before burying the ball and the sides were level again. A draw would not do for Tom’s though. 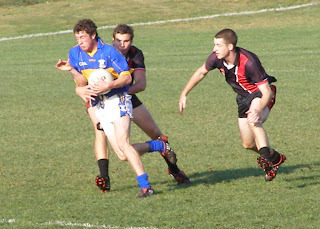 The chance to win the game opened up for substitute Ger Henley, and Henley took the point without hesitation. Tom’s ahead by a point now. Tipp still could have equalized, but some do or die defending saw Tom’s holdout until the final whistle. Tom’s and Galway play next week, and Tom’s have to win to force a playoff, effectively a quarter final, against who else, but old rivals Galway. Hurling fans, hold on to your seats. Tom’s: A. Bendon, S. Staunton, P. Callinan, J. Dowling, D. Dooley, D. Moore (0-2), F. Keenan (1-6), C. Healy, S. Howley (1-1), T. Kelly (0-1), M. Callnan, J. Cuddy, E. Murphy (1-0). Sub: G. Henley (0-1). Tipp: J. Howard, M. Heffernan, N. Ryan, E. Ryan, D. Young (0-2), B. Howley, M. Jordan, C. Dempsey, C. Kavanagh (1-1), P. Howard (0-1), J. McCarthy (0-5), S. Menton (0-4), P. McGrath (1-0). 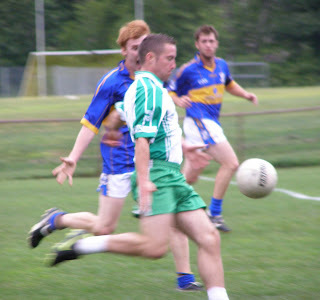 The Blues made sure that there would be no comeback for the Connemara Gaels this week with a convincing win. The Blues secured a senior championship playoff place and there is no reason to believe that they cannot go on to even better things this year given their recent performances. The Gaels fell behind early, and unlike a week ago, were unable to launch a miracle comeback as the Blues kept a tight grip on the game and did not let up until the last five or ten minutes when the game was safe and several veterans were then introduced to the fray. The Blues set the tone early. Stephen Gilmartin was in fine form in midfield and the early traffic was all in one direction. The Blues clocked up six points in the first ten minutes, the Gaels opened their account after 12 had passed. 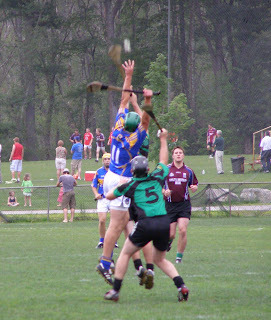 The Blues forwards caused numerous problems for the Gaels. Lee McQuade and Colm McGee on the wings, and corner forwards David O’Callaghan and Alan O’Donoghue worked hard. All four of the aforementioned front men pointed, while Simon Sinnott sallied from the half back line to add the sixth. Colin Harkin and Aiden Flanagan put back to back scores together for the Gaels, but the westerners could not get settle into any kind of sustained form. The Blues had a virtual monopoly on possession and quickly took a hold of affiars again. O’Callaghan, McGee,and Brian Maloney put four over between them, and Cormac Arkinson came from corner back to point the third for the Gaels. At the break the Blues led by seven points. 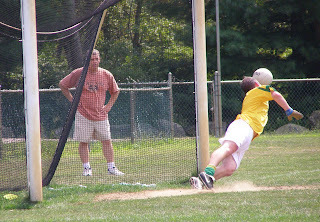 Cormac Arkinson shoots for the Gaels. 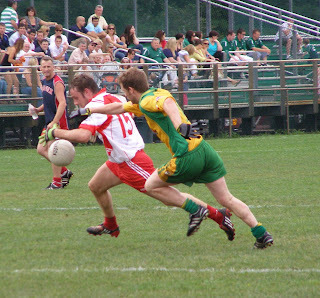 The Gaels efforts at replicating last weeks comeback were hampered on two fronts. Some poor shooting resulted in several wasted chances. 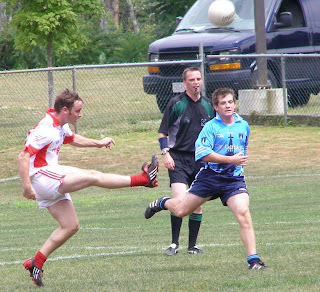 Also, the sending off of Kevin Owens for an off the ball incident did not help the Gaels cause. Ten minutes into the second period, after the Blues had added two more points, the Gaels won a penalty when Mark Dougan was pulled down in the box. 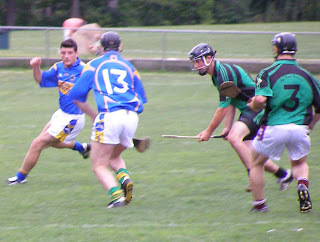 Dougan’s initial shot was saved, but Colin Harkin was first to the rebound to make it a six-point game. The Gaels hopes of pulling off another comeback were quickly extinguished as within five minutes the goal was erased courtesy of three points, two from Gilmartin and one from McQuade. Michael Magill interrupted the Blues onslaught with a point, but once David O’Callaghan netted for the Blues with less than 10 minutes left that was it. John O’Brien scored a consolation goal, and the Gaels are now looking at the intermediate playoffs, while the Blues are looking to knock McAnespies off their perch. Blues: D. Hawes, S. Kelly, T. Wallace, B. Maloney (0-1), P. O’Brien, S. Sinnott (0-1), S. Gilmartin (0-3), P. Lydon, L. McQuade (0-2), S. O’Mahoney, C. McGee (0-3), A. O’Donoghue (0-1), D. O’Callaghan (1-6). Gaels: P. O’Malley, C. Arkinson (0-2), C. Conroy, C. Flanagan, A. Flanagan (0-1), K. Owens, C. Harkin (1-1), J. Flaherty, T. McDonagh, M. Magill (0-1), J. Moore, M. Dougan, J. O’Brien (1-0). Brighton rival clubs, Armagh-Notre Dame and Galway met in a game with intermediate playoff implications and there was but a hair between the sides as the game could have gone to either side. In spite of playing second fiddle on the balance of play for the first half, the northerners went in at the break with a one point lead and went on to win the game in spite of being a man down for most of the second half and having to defend against a Galway team that threw everything at them in the final ten minutes. 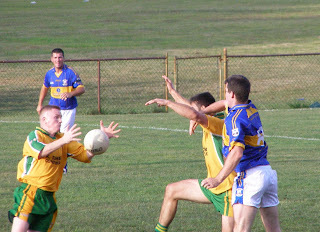 Alan Glynn breaks out of defence. The first 10 minutes were evenly contested, each side converted twice. Galway suffered a blow, however, as Brian Hanlon’s participation was cut short due to an injury, and the westerners surely missed his scoring prowess in the latter stages of the game as they launched several attacks that fell short at the final hurdle. Neil Jordan opened the scoring for the northerners with free. 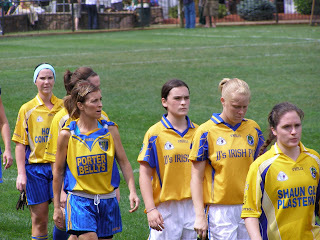 Hanlon brought the sides level before having to depart the fray. After Greg Rogan and Jordan traded points to make it two each, Ryan O’Dwyer scored a cheeky goal. Running through and with the keeper advancing to meet him, O’Dwyer chipped the ball over the keeper and Galway led by a goal. Rogan made it a four-point Galway lead and the tribe were humming along, while their opponents stuttered. The men in orange picked things up a tad and were soon back on level terms. Darren Gilsenan got fouled running through and Jordan popped the 14 yard free over. Then largely against the run of play the scores were leveled thanks to a Brian Boylan goal. Boylan finished a sweeping move, the best of the game to that point from the northern side, and blasted the ball into the back of the net. Boylan then put a long range free over the bar to put Armagh-Notre Dame a point ahead at the half. Galway must have regretted several missed chances as they outplayed their opponents for most of the half, and led their guard down in the few minutes before the break. Dominic Magill is closely guarded by Shane Melia. 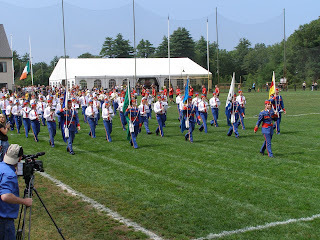 The second half was keenly contested as Armagh-Notre Dame sensed that the day could be theirs. Both corner backs did well and many’s a Galway attack faltered at the last line of defence. Niall Lennon and Damien Burke also led the charge out of defence on several occasions as if to send a message to their cohorts to keep up the pressure. Dominic McGill extended Armagh’s lead to two points with the opening point of the second half, and Greg Rogan answered in kind for Galway. Neil Jordan restored the lead to two, and the northern side lost Fergal McClelland, who had been introduced as a substitute, to a sending off for an off the ball incident. Leading by two points and a man down, the northerners had it all to do with 20 long minutes remaining to play. Galway surged forward in search of a decisive goal, and Padraig Howard almost got it, but his shot from an acute angle hit the outside of the post. Jordan then extended the lead to three points with a 21-yard free, and Howard pulled it back to two with a point for Galway. Then Donal Redmond almost put Galway into the lead, but his chip towards the far corner came back off the inside of the post, much to the relief of the orange jerseys and their supporters. Exciting stuff, but that was not all. Adrian Kelly got Galway to within a point, and Darren Gilsenan restored it to two with a fine score. Kieran Lillis came through the middle to bring it back to a single point as Galway came forward in numbers with time running out. Galway had a chance to level matters with almost the final kick of the game, but Greg Rogan’s long range free drifted to the left and wide. Great celebrations for Armagh-Notre Dame as a season that seemed destined for the dumpster is now salvageable. A win against Mayo next week means an intermediate playoff spot. Armagh-ND: C. Molloy, D. Burke, N. Lennon, F. Meehan, M. Graham, G. Gilsenan, D. Gilsenan (0-2), B. Boylan (1-1), A. Blake, S. McCorry, M. Tiffany, N. Jordan (0-4), D. Magill (0-1). Galway: B. Calvey, A. Glynn, S. Melia, JJ O’Neill, K. Lillis (0-1), R. O’Dwyer (1-0), G. Rogan (0-2), S. Gallagher, P. Howard (0-1), A. Kelly (0-1), P. Nolan, D. Redmond, B. Hanlon (0-1). Sub: J. Keogh. Shannon Blues book semi final spot with a 1-17 to 2-5 win over the Connemara Gaels. 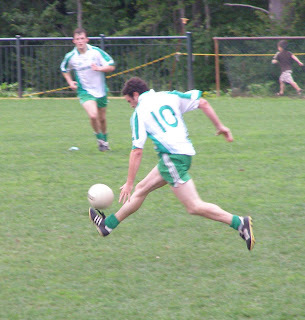 Christopher's beat Wolfe Tones by a score of 1-8 to 0-9 Saturday, and the Tones have to now wait and see if Kerry can beat McAnespies to force a playoff against their Southie nemisis for a senior semi-final place. Armagh-Notre Dame beat Galway 1-8 to 1-7 in somewhat of a surprise, and look like making the intermediate playoffs. Fr. Tom's pulled off the surprise result of the weekend with a one point win over Tipperary to keep their interest alive in senior Hurling. Also, Roscommon pulled off a win over the Shamrocks in the Ladies Senior Championship - a playoff between the two awaits to see who will meet Tir na nOg in the final at the end of this month. There was some controversy at the end of the Kerry v Galway game as Kerry had nudged themselves into a 0-13 to 0-12 lead late in the game. With Galway leading by two points, Robbie Croft put three frees from off the ground over the bar. Trailing by a point, Galway were attacking with the last possession of the game and the referee awarded a free in for what seemed to be a fair shoulder by a Kerry defender, and Greg Rogan chipped the ball over for the leveling score with the final kick of the game. Needless to say, that ended Kerry's outside shot at a playoff since the Kingdom can only finish with 9 points and a minimun of 10 is needed to have any chance. In fact, there could be playoffs with 4 teams on 12 points if the Blues, McAnespies, and Wolfe Tones all win their final games. Donegal are the only side that would avoid a playoff for sure if they beat Cork in their final game. In senior hurling it looks like Tipp and Wexford are the most likely finalists, but Galway and Tom's could produce a surprise. Cork are out of it with their loss to Galway. A week is a long time in football. 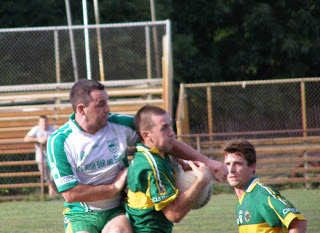 After dispatching of high-flying Donegal last week with a focused, efficient display, McAnespies fell to a depleted Connemara Gaels. 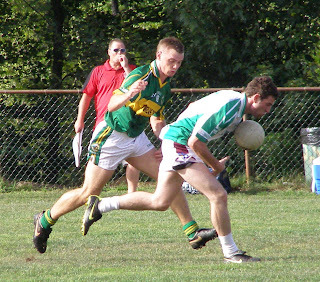 The Gaels performances have been inconsistent this season, but the Connemara men produced the comeback of the season with a passionate and committed second half display. After the first 30 minutes it looked like a handsome McAnespies win would be the inevitable outcome, but the Gaels raised their game in the second half and overcame an 11-point deficit to leave McAnespies scratching their heads wondering how they could so easily push past their opponents in the first half, yet still not win the game. Neil McAdam wins the ball for McAnespies as they ran over their opponents in the first half. 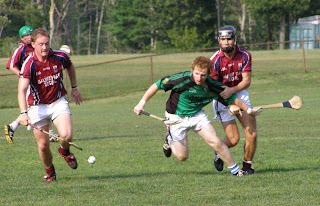 McAnespies were missing Mark McGovern and rearranged the team slightly, but the Gaels found themselves having to call up Pat O’Malley and Michael Kelly from the junior squad. 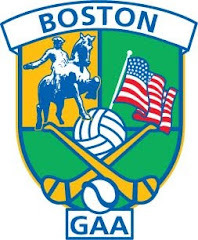 The South Boston side had the ball in the Gaels net twice within the first eight minutes, the first was from an Alan Nestor penalty. 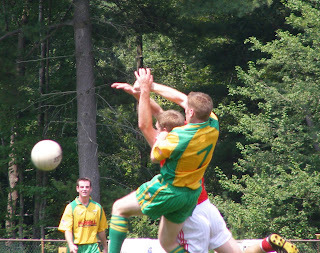 Nestor was fouled in the area as he ran through the Gaels defence and took the penalty well. The second came courtesy of Luke Sweetman. The Erins Isle clubman was found unmarked at the far post and his close range shot cannoned into the far corner. 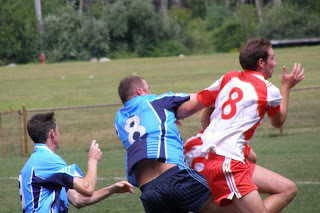 The Gaels picked up two bookings as the backs were forced to resort to containment of an illegal nature, such was the manner in which they struggled to hold off the rampant McAnespies forwards. Gaels corner backs Cormac Arkinson and Colin Flanagan worked hard to try and keep Jamie Kelly and Colm McCrory in check, but McAnespies came out of the half back line strong, and Rory Maguire and Colm Donnelly in the half forward line proved to be valuable link men. McAnespies tallied eight points for the remainder of the half and were seldom troubled at the back. Colin Harkin, John O’Brien, Tom McDonagh, and Michael Magill managed points for the Gaels, while for McAnespies, Jamie Kelly, Colm McCrory, Rory Maguire, Gary Clarke, Sweetman, and Colm Donnelly found the mark. At the half McAnespies were ahead by 11 points, and the outcome seemed to be already decided. A midfield tussle as the tension mounts in the second half. Nobody could have forecast what was coming in the second half. Two goals in the fifth and sixth minutes breathed new life and belief into the Gaels. Michel Magill caught the McAnespies defence unawares and planted a 14 yard free into the back of the net five minutes in, and one minute later Colin Harkin ran through the opposing back line to fire home a second. Given the way the first half went,even this appeared to be a blip on the radar. Colin Harkin and Aiden Flanagan lifted things in the middle with some fine fielding as the Gaels won more and more possession. McAnespies on the other hand seemed to be happy to maintain cruise control. Having to remove Colin Moore and Alan Nestor from the fray did not help, and the Gaels to their credit took full advantage. Michael Magill found a new gear as he and Colin Harkin ran at the opposing defence. With 10 minutes to go the difference between the sides was three points, Tom McDonagh, O’Brien (a superb score), and Magill pointed for the Gaels, while McCrory kept some distance between the teams with two points. Michael Magill in full flight as the Gaels run at McAnespies in the second period. 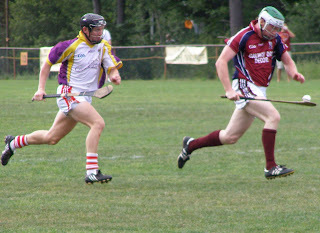 After Jamie Kelly restored the lead to four points in McAnespies favour, and Michael Magill reduced it to a goal, the Gaels kicked three straight wides. A brave comeback that fell short seemed to be the story for the record. Colm McCrory seemed to get the insurance point with one minute left, but Michael Magill put a free kick over for the Gaels to make it three between the sides once again. The Gaels then won a free on the edge of the square, and Magill tried to force the ball through the wall of McAnespies defenders. The Antrim man picked up the rebound and fisted the ball across the crowded goalmouth for Colin Harkin to punch home and level the game. Could the Gaels do the unthinkable? None other than Michael Magill put the winning point over the bar three minutes into injury time to the cheers of the Connemara supporters. A fantastic win for the Gaels, and for McAnespies there may be some figuring out to do if the championship is to be retained. Gaels: P. O’Malley, C. Arkinson, C. Flanagan, C. Conroy, A. Flanagan, K. Owens, C. Harkin (2-1), J. Flaherty (0-1), M. Kelly, M. Magill (1-5), T. McDonagh (0-3), J. Moore, J. O’Brien (0-2). Macs: D. Wright, C. Moore, D. Donegan, K. Hudson, N. McAdam, A. Nestor (1-0), G. Clark (0-1), N. Donaghy, C. Donnelly (0-1), R. Maguire (0-2), L. Sweetman (1-1), C. McCrory (0-7), J. Kelly (0-2). Galway bounced back following last week’s defeat to Fr. Tom’s. The tribesmen dispatched Cork with a minimum of fuss and, it must be noted, in a much better tempered game than the last time these sides met. The tribesmen and were one step ahead of their opposite numbers in all facets of the game. The sharpshooting James Moylan clocked up the scores in the points column for Galway, while Peter Buckredge at center back and Sean Kelly in the middle of the field kept the prevalent flow of the game in the direction of the Cork goal. The Galway forwards capitalized and after the first 30 led by 12 points and never looked like letting up. Veteran, John Byrne netted a hat trick to round off a markedly improved Galway performance. 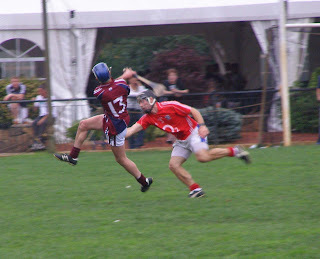 John Moylan points for Galway as Ronan Good tried to block. Cork opened the scoring through Mike Allen, who pointed a free. Galway then went on a 2-12 to 0-2 tear. Moylan proved to be the main marksman for the tribe. Dubliner, Buckredge, anchored the half back line well, while midfielders Kelly and Greg Lyons held the edge over their opposite numbers in red. Galway’s goals both came from the stick of John Byrne. Byrne maintained his composure on both occasions to find the back of the net from close range. Well out of the game, Cork got some hope back right at the end of the half as Brian O’Loughlin netted, but a few more goals would be required in the second half if the rebels were to stage a comeback. There would be no comeback as Galway kept up the tempo and the pressure on Cork’s back line. Diarmaid Lynch and Declan O’Dwyer complimented Moylan’s shooting with some well taken scores of their own. Cork sputtered and never raised their game to the level of their opponents. O’Loughlin and Allen managed a couple of points, but at the end of the game Byrne netted his third goal and Galway are back on track for the playoffs in a couple of week’s time. Cork: P. Mannix, T. Scanlon, R. Good, T. Barrett, T. Healy, W. O’Brien (0-1), B. Butler, E. Hegarty, D. Cotter, P. Hughes (0-1), T. Kenneally, M. Allen (0-3), B. O’Loughlin (1-1). Galway: N. Roberts, T. Linnane, A. Hogan, E. Daniels, P. Buckredge, J. Kinsella, G. Lyons, S. Kelly (0-3), L. Creavin (0-1), D. O’Dwyer (0-3), D. Lynch (0-1), J. Moylan (0-12), J. Byrne (3-0).